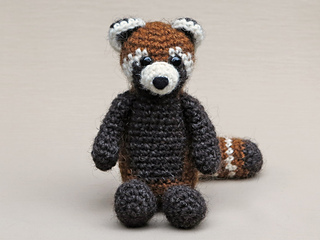 This is a .pdf crochet pattern, written in standard American crochet terms. 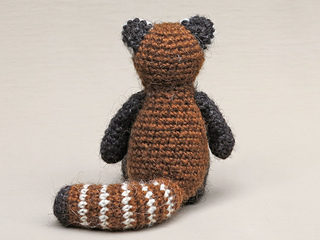 With this pattern you can make a very sturdy and playful red panda doll. 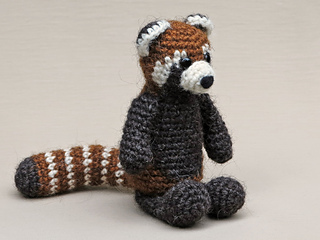 Size of finished red panda made with worsted weight yarn: 5.1 inch / 13 cm when sitting. 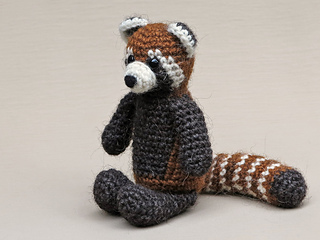 For this crochet red panda you’ll need worsted weight yarn and an E US/3.5 mm crochet hook. 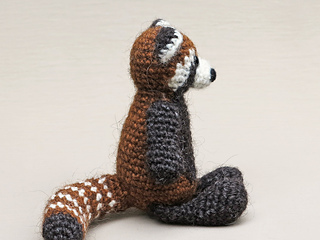 You’ll need three colours of yarn, dark brown (1/4 of a 100 yard skein), rust (1/4) and and a small amount of white. For the eyes I’ve used 8 mm animal eyes, and I needle-felted a nose (a bit wider than the eyes), but any other kind works too. 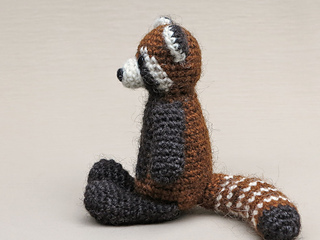 You will also need fibrefill and pellets for a bit of extra weight in the body (I use Hama beads) and a pipe cleaner if you want the tail bent. Lopi colour numbers: dark brown 0052, rust 9427 and white 0051.